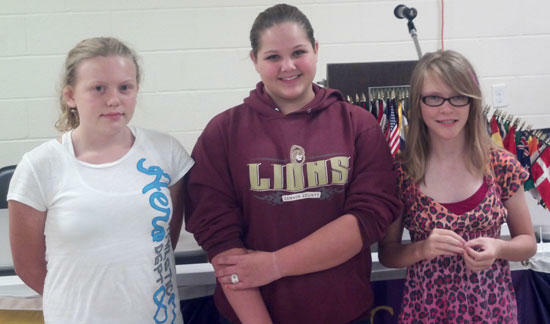 From left are Kirsten Garrison, Mary Espy and Chloe Dill, who were recently initiated into the Cannon County 4-H Honor Club. The 4-H Honor Club is a recognition of their hard work and dedication to the 4-H club program. The goal of the 4-H Honor Club is Leadership Development and Service Learning, and is open to all 4-Hers in the 4th through 12th grades. For more information on the 4-H Honor Club, or other 4-H projects, activities, and events, please call UT Extension, Cannon County at 563-2554.